All new teeth. Four little implants. 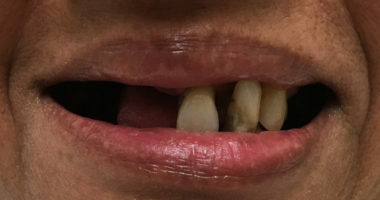 All-on-4 consists of a fixed set of prosthetic teeth, which fits in your mouth securely and comfortably because it's permanently attached to four dental implants. 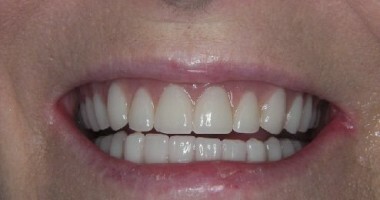 This is the most efficient and comfortable way to get a fully functional set of teeth. If you (or someone you know) wants to start fresh, the All-on-4 dental implant procedure might be the perfect option. Restore your appearance and eat the foods you love again. Central Park West Dentistry is excited to be working with expert provider Dr. E. Robert Wardius to give our patients in New York the option of this groundbreaking improvement in modern dentistry. 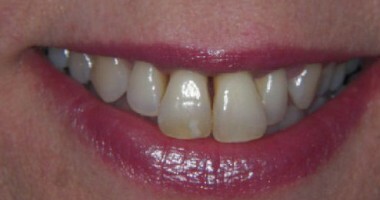 It’s called an “All-on-4” because it can restore all of your teeth with just four dental implants. 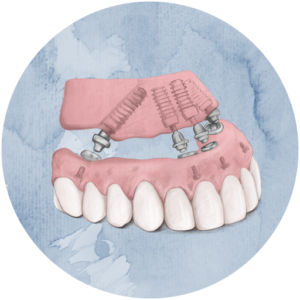 The implants support an entire prosthetic arch of teeth, providing a comfortable and durable permanent alternative to dentures. 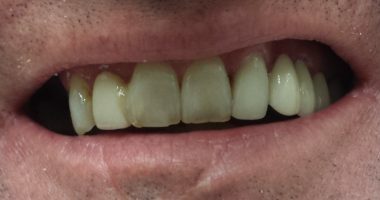 The treatment is not for everyone, but it can be a truly life-changing opportunity for people who need a full arch restoration. Here’s an actual email the Central Park West Dentistry team received from a grateful patient who recently saw Dr. Wardius for an All-on-4. “Words can’t describe how I feel. 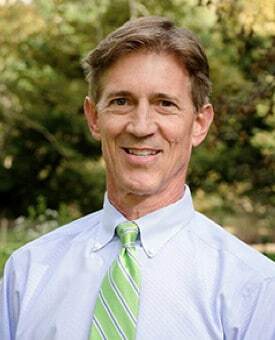 As you know, I was quite nervous about the procedure and found in Rob [Dr. Wardius] a professional who engendered a unique combination of compassion and care that I have never experienced.The procedure was executed flawlessly. The entire office staff was attentive and professional. Rob was totally focused and I felt no hesitation at the last minute. The post-op was a bit uncomfortable the first 2 days, however, Rob was in constant touch which meant a lot to me. It doesn’t matter why you want a fresh start. Maybe you were in an accident, missed years of dental check-ups, or were simply born to periodontal disease…whatever the reason, the important thing is that we can help you move forward. And we can do it without years of ongoing dental work. Some offices call the All-on-4 procedure “Teeth in a Day” but we know that’s not 100% accurate. The whole process takes just a handful of office visits with Dr. Wardius. We provide many sedation options, including IV sedation with a board-certified dental anesthesiologist. 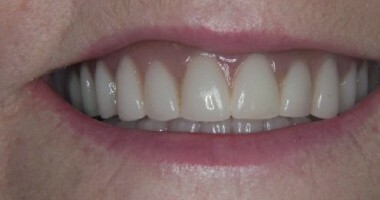 All-on-4 is a wonderful alternative to dentures because it offers a more comfortable and more secure arch of teeth. Before the invention of the All-on-4, an implant-based alternative to traditional dentures would require six or more implants and up to eighteen months of treatment. 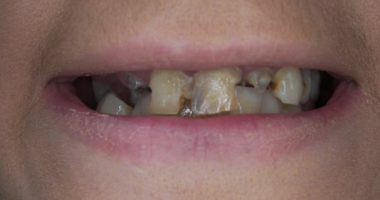 Often, this meant you would be stuck without any teeth or with a poorly fitting temporary denture for over a year as you waited for implants to heal or moved from doctor to doctor. The All-on-4 changed all that. 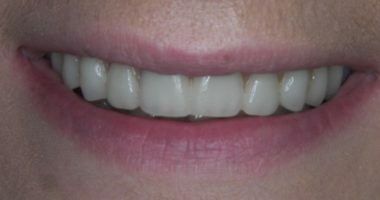 Now, Dr. Wardius can place implants at an angle that allows them to immediately support a full arch of teeth on the same day. Dr. Wardius has provided All-on-4 treatments for more than 300 patients over the last fifteen years. He’s a gentle perfectionist, and he’ll be overseeing every step of your treatment to ensure each aspect is up to his standards. At many offices, you’d see different providers for different parts of the All-on-4 treatment. Because Dr. Wardius is able to both place and restore implants, you know you’ll be in his capable hands throughout your care. You’ll have a relaxed, comfortable, and totally personalized experience. In fact, on the day of your main treatment visit, you’ll be the only patient in the whole office, which guarantees you’ll have all the undivided attention you need. What is Dr. Wardius’s success rate? Dr. Wardius’s personal success rate is 99.3%. 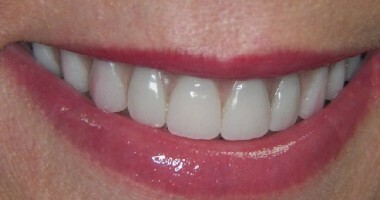 What implant system does Dr. Wardius usually use? In most cases, Dr. Wardius uses a combination of Neodent and Nobel Biocare implants but you can always ask him for the details of your specific treatment. Neodent was founded in 1993, and has over 20-year experience in the design, development, and manufacture of dental implants. Every year, Neodent implants are chosen by more than 45,000 customers in over 40 countries. Nobel Biocare has been a leader in the field of implant-based dental solutions since 1952, and the company is committed to the highest scientific standard. Dr. Wardius is able to offer the treatment to almost everyone interested, including people who have been told elsewhere that they can’t have implants. A 3D Cone Beam CT scan can help us confirm that you’ll be a good candidate. You might benefit from an All-on-4 if you’re missing over 6 teeth in an arch, or if you have you have severe periodontal disease, a history of acid reflux, or trauma. What does a typical All-on-4 treatment timeline look like? 1) First Visit | Consultation. Dr. Wardius will see you for an initial visit that will last between one and two hours. During the first hour, he’ll take x-rays and a 3D Cone Beam CT scan of your teeth, and then review your treatment plan and answer all of your questions. If you decide you’d like to move forward with treatment, he’ll take impressions of your teeth and one of our financial coordinators will go over the financing options with you. 2) Two weeks later | Main treatment visit. 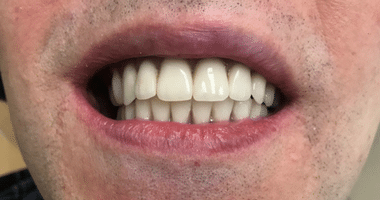 You’ll come to the office in the morning with whatever dental problems you’ve been struggling with, and leave in the afternoon with beautiful, fixed, functional temporary teeth. 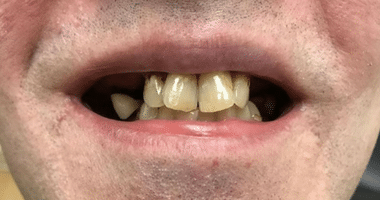 In this one appointment, Dr. Wardius will remove any damaged teeth, then place between two and four dental implants, and attach a completely natural-looking temporary restoration to them. One of the amazing benefits of the All-on-4procedure is that you are comfortable the entire time and have little postoperative sensitivity. You’ll have the option of IV sedation with Dr. Joseph, so you’ll be in a relaxed, dream like state throughout the visit, and wake up with new teeth. 3) Two weeks later | Post-op visit. Dr. Wardius will evaluate healing and remove your stitches. 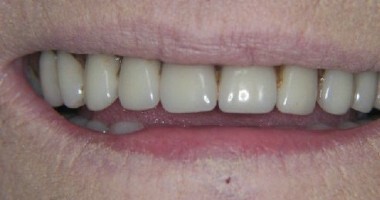 At this point, he’ll take some additional impressions for your permanent, metal reinforced prosthesis. 4) Three to six months later | Permanent arch visit. The healing process will be complete, and you can receive your permanent, metal reinforced prosthesis. What are the prosthetic arches made out of? During the course of your treatment, you’ll have a temporary arch and then a permanent arch. Both arches are very natural looking. The temporary arch is made entirely out of acrylic. The permanent arch is typically made of acrylic reinforced by metal. 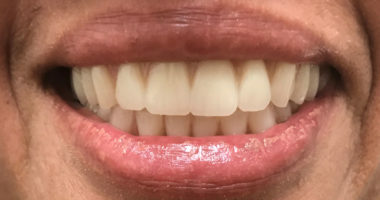 In some cases, the permanent arch can be made from a durable material called Zirconia instead of acrylic, but this adds to the cost of the arch. Dr. Wardius can go over these options with you in detail. Can I eat anything I want right after the main treatment visit? Not quite. 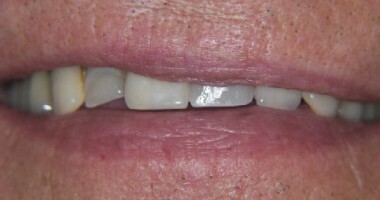 The All-on-4 is unique because just four implants can immediately support a full arch of teeth. However, it takes about three months for the implants to heal completely. During those three months, you’ll need to cut all of your food with a fork. You’ll be able to eat most things, but you’ll need to be gentle. Once everything is healed and you have your permanent, metal reinforced arch, then you’ll be able to enjoy food the way you used to. If I need two arches, should I do them at the same time? While Dr. Wardius will work with you to find the best treatment plan for you, in general, it’s best to do them both at the same time. 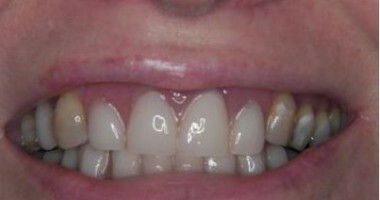 Completing treatment on both arches at the same time allows Dr. Wardius to have the most control over the alignment of your bite. It’s also cost-effective because our anesthesiologist only needs to make one visit. All-on-4 is an investment. Without actually meeting you and seeing your 3D x-rays it’s difficult to provide an accurate estimate. The fee will depend on if you need one arch or two. It will also vary according to any additional treatments you might need to prepare for the arches, like a sinus lift or extraction. In general, an All-on-4 will be less costly than a traditional treatment involving many implants that require time to heal. We have a variety of flexible payment options available including The Lending Club and Care Credit. Do you want to walk into our office in the morning, leave behind whatever dental curve-balls life threw your way, and walk out of the office in the afternoon with a new set of beautiful, fixed, functional teeth? If the answer is yes, please reach out to us for a no-charge consultation with Dr. Wardius. 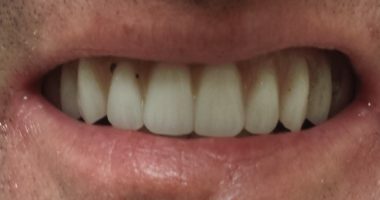 “ I had been embarrassed and ashamed of my smile for years, but I also knew I had to do something since most of my teeth were failing. I made an appointment with Dr. Wardius and although I was scared, I mustered all of my courage and walked into his office. I was greeted by a terrific staff, and within my first appointment I knew I had made a great choice. It has been 6 months and I feel and look great. The entire staff made sure that my experience was top notch. 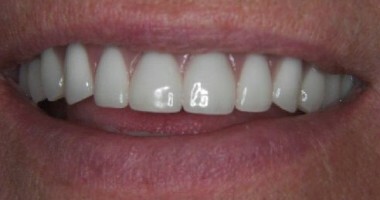 “ Dr Wardius is an excellent dentist the staff is wonderful. Shout out to Christy for all of her support. Dr. Wardius four in one procedure saved me from eating issues and medical problems related to gum disease and heart disease. He is an exceptional dentist because he is so mindful about medical issues associated with gum disease and advocates prevention rather then other dentists who see patients for years of costly and painful dental procedures with no end in site to solve the problem. I highly recommend him. 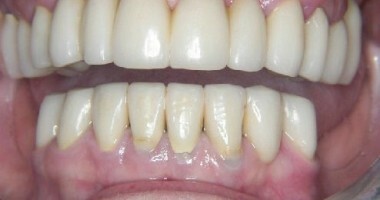 “ My whole entire life people would tell me I had a beautiful smile until gum disease robbed me of that. I felt at 50 years old, I was far too young to deal with dentures. I went to a place that was what I would call a "factory" left there and was so upset. Then my fiance told me about Dr. Wardius, said I should see him, and I did. The procedure was a snap, I was in here, out of it, and then the next thing you know I woke up and had new teeth! It was amazing. “ Dr. Wardius, thank you so very much for your kindness, calmness, and making me feel like I was not just another number coming through. “ I would recommend the All-on-Four for anyone who is in the position I was in when I decided to do it. 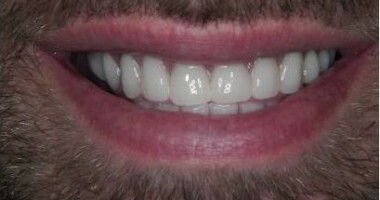 I'm so happy it turned out the way it did and I have the teeth that you see. “ When I came for my consultation and Dr. Wardius told me how I could have the procedure in one day, for me that was miraculous. I was on my second set of failed bridge work and I just didn't want to go through the pain of all that again. I didn't want false teeth, I like to smile, I like to eat, who doesn't? 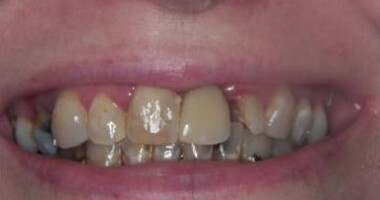 If you want to change your life and be free of dental work, the All-on-Four is definitely the way to go. “ I had bad teeth all my life and I hated going to the dentist. When I started coming to Dr. Wardius the fear was gone. After the All-on-Four I have no pain, no toothaches and I can eat apples again - it's so much easier without my partial plate flipping out all the time. “ Dr. Wardius said that one of his big things was making things as painless as possible, and when he said that, he was right. It was definitely painless, I had no problems during the procedure, and then afterwards recovery was great. There was a little discomfort, but as far as going back to my daily life, you definitely can do it. The teeth, oh my gosh...natural is definitely the word for it! “ I always had a lot of problems with my teeth over the years. 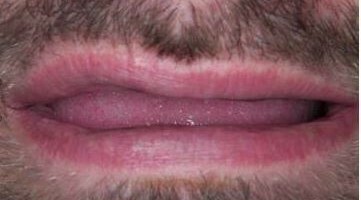 The All-on-Four is the best procedure I have ever had done! The procedure itself wasn't painful at all. I'm so grateful I had it done!